The Hadza are an indigenous ethnic group in north-central Tanzania, living around Lake Eyasi in the central Rift Valley and in the neighboring Serengeti Plateau. The Hadza number just under 1,000 in total. Some 300–400 Hadza live as hunter-gatherers, much as their ancestors have for tens of thousands of years. They are among the last hunter-gatherers in the world. Their click language echoes the earliest language spoken by ancient humans tens of thousands of years ago. Linguists speculate that the clicks made by the Hadzabe of East Africa and also San people of southern Africa are the linguistic equivalent of living fossils preserved from a much older and more primitive tongue, probably spoken by most of the humans who lived more than 40,000 years ago. One probable scenario is that click speaking came about because it helped people to communicate while hunting – animals are known to be scared by human language but take little notice of click speaking. 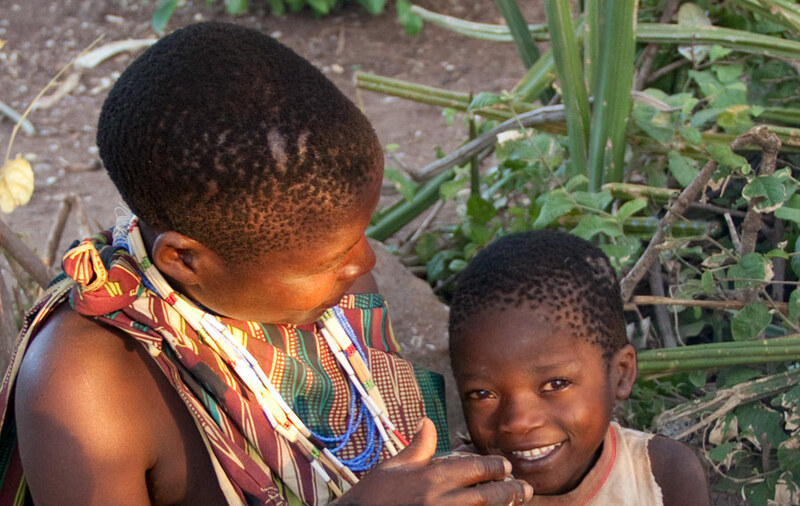 Hadzane is not at all related to any language of the immediate neighbors of the Hadza, a fact that suggests the Hadza have maintained a considerable degree of isolation. According to oral tradition, in the beginning of time, the world was inhabited by hairy giants called the Akakaanebe or Gelanebe, "ancestors". The Akakaanebe did not possess tools or fire; they hunted game by staring at it and it fell dead; they ate the meat raw. They did not build houses but slept under trees, as the Hadza do today in the dry season. In older versions of this story, fire was not used because it was physically impossible in the earth's primeval state, while younger Hadza, who have been to school, say that the Akakaanebe simply did not know how. In the second epoch, the Akakaanebe were succeeded by the Tlaatlanebe, equally gigantic but without hair. Fire could be made and used to cook meat, but animals had grown more wary of humans and had to be chased and hunted with dogs. The Tlaatlanebe were the first people to use medicines and charms to protect themselves from enemies and initiated the epeme rite. They lived in caves. The third epoch was inhabited by the Hamakwabe "nowadays", who were smaller than their predecessors. They invented bows and arrows, and containers for cooking, and mastered the use of fire. They also built houses like those of Hadza today. 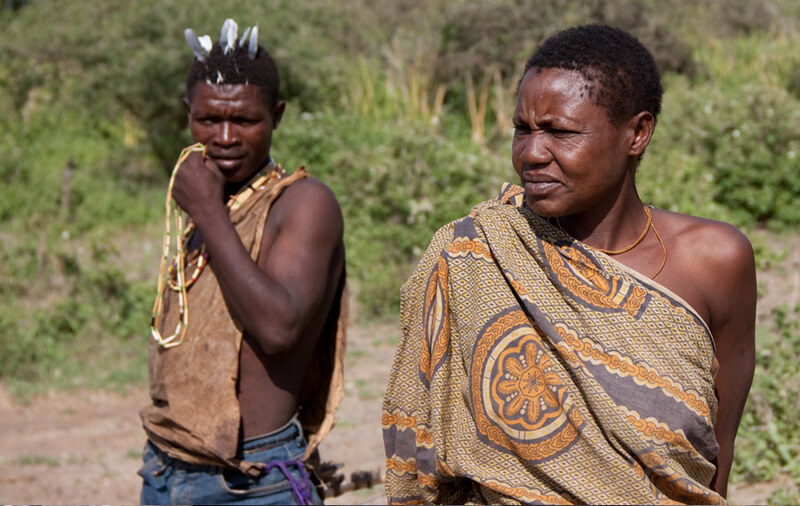 The Hamakwabe were the first of the Hadza's ancestors to have contact with non-foraging people, with whom they traded for iron to make knives and arrowheads. The Hamakwabe also invented the gambling game lukuchuko. The fourth epoch continues today and is inhabited by the Hamaishonebe, "modern". When discussing the Hamaishonebe epoch, people often mention specific names and places, and can approximately say how many generations ago events occurred. Their own religion is minimalist. They do have a cosmology and men can tell endless stories about how things came to be. They do not believe in an afterlife and there are few religious restrictions. What few rules there are often go ignored with little consequence, except for the rules about eating the men’s special ceremonial epeme meat. Illnesses may be attributed to violation of these rules. The most important ritual is the epeme dance. In camps with enough adults this takes place after dark on moonless nights. Men wear bells on their legs, a feather headdress, a cape, and shake a maraca as they sing and dance one at a time in a call-and-shout manner, inspiring the women to sing and dance around them. The other main ritual is the Mai-toh-ko, or female puberty initiation, which happens when the berries are ripening. Pubertal girls gather in a camp where they are covered with animal fat and adorned with beads, then chase boys and try to hit them with their fertility sticks. The Hadza move camp for a number of reasons. Conflict is resolved primarily by leaving camp; camps frequently split for this reason. Camps are abandoned when someone falls ill and dies as illness is associated with the place they fell ill. There is also seasonal migration between dry-season refuges, to better hunting grounds where water is more abundant, and areas with large numbers of tubers or berry trees when they are in season. Moving camp is easily accomplished, as individual’s possessions are few enough to carry on their backs. Shelters consisting of a few branches bent to form a very basic makeshift shelter are built in a few hours. When it rains they move into nearby caves. Most often, during dry weather everyone sleeps around a fire built on the ground. Lighting a fire is quickly accomplished in about 30 seconds by twirling a stick between the palms and creating friction with a hollowed out piece of soft wood then gradually feeding the resulting fire with dried grass. 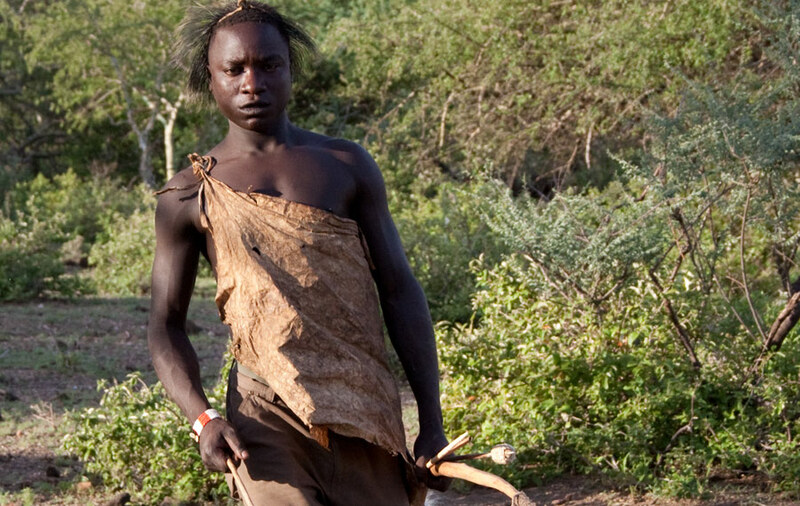 Although most Hadza wear western style shorts and shirts, many still prefer traditional dried animal skins draped across the body as clothing. In recent years, the Hadza's territory has seen increasing encroachment from neighboring peoples. 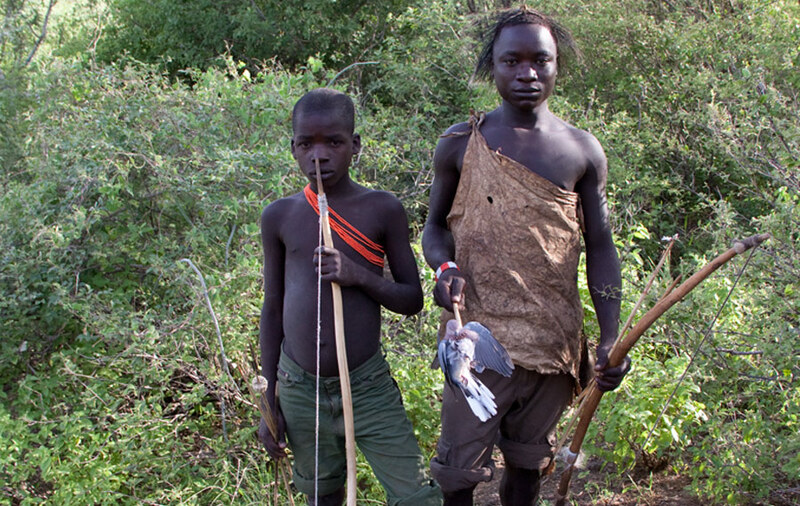 The western Hadza lands are on a private hunting reserve, and the Hadza are officially restricted to a reservation within the reserve and prohibited from hunting there. The Yaeda Valley, long uninhabited due to the tsetse fly, is now occupied by Datooga herders; the Datooga are clearing the Hadza lands on either side of the now fully settled valley for pasture for their goats and cattle. They hunt out the game, and the clearing destroys the berries, tubers, and honey that the Hadza rely on, and watering holes for their cattle cause the shallow watering holes the Hadza rely on to dry up. 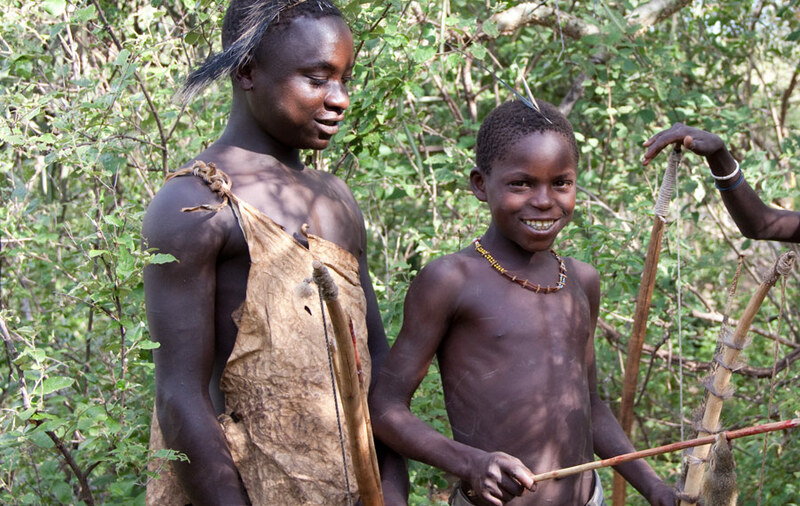 The Hadza are highly skilled, hunters and foragers, who adjust their diet according to season and circumstance. 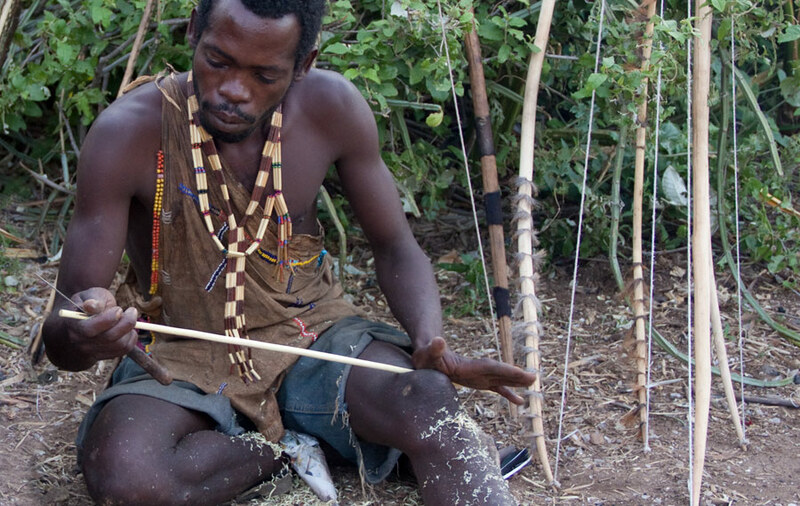 Hadza men hunt individually or in groups and use simple bows and poisoned arrows to hunt small and large game. If they catch small animals - such as squirrels or birds - they will light a fire, toss the carcass into the flames to cook and eat it then and there. The larger animals that are small enough to carry are taken back to the family camp. However if the animal is too heavy to carry comfortably, the entire family will relocate to the kill site. When the hunters take home a kill, everyone in their camp shares it. During the wet season when animals are not always available, the diet is composed mostly of honey, available fruit and tubers, and occasionally meat. Availability of meat increases in the dry season, when game is concentrated around water sources. During this time, men often hunt in pairs, and spend entire nights close to waterholes, ready to shoot animals that approach for a night-time drink. The poison for the arrows is made from the highly toxic sap from the shrub: Adenium coetaneum. To gather honey from the hives of wild bees, the Hadza drive pointed sticks into the trunk of the tree to build a ladder for climbing up to the bee hive. A remarkable relationship exists between humans and the honey-guide bird. To more easily find wild hives, the Hadza mimic the honey-guide’s bird song, at which point the bird leads the hunters to the hive. Once the humans have broken open the hive and taken the honey, the bird feeds on the remaining wax and larvae. Hadza today trade meat, skins, and honey in exchange for tobacco, marijuana, maize, millet, clothes, beads, cooking pots, and scrap iron for making their axes and arrowheads. They no longer use clay pots but prefer metal pots and they no longer use brass neck rings. Nowadays, the Hadza also receive some beer from their neighbors, and sell some crafts to tourists. They also receive a variety of goods from researchers, especially clothes and nails for arrowheads. It may be that Hadza culture, which has remained little changed despite long contact with more powerful neighbors, will now, with the arrival of tourists, finally succumb to outside influences, largely because the tourists are a source of money. The irony is, of course, that the tourists come because they want to see real foragers and once they have completely eliminated real foraging the tourists will no longer come, leaving the Hadza with no source of income.